Slots Capital Casino has just unveiled a spooky new Halloween slot game from Rival Gaming called Dr. Akula. The casino is giving all players 20 free spins on the new game, no deposit required. Additional free spins and bonus cash are available with deposits. 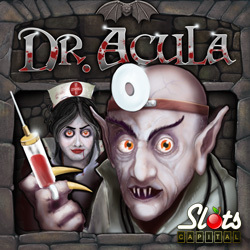 Dr. Acula is a 3-reel slot game brimming with bats, blood and booty. Assisted by his charming nurse and his bevy of bats, Dr. Acula has a sure cure for whatever is ailing his patients. A squirty syringe, pulsating plasma bags and tinkling test tubes spin on the new game’s reels. Three Dr. Akula symbols, with a max bet of three $5 coins per line wins the game’s jackpot of 1000 coins. 60X rollover; $180 max cash out. Available October 16-18, 2018 only. Available October 16-31, 2018 only. 45X rollover, no max. cash-out. A series of Halloween deposit bonuses culminating in 100 free spins on the Scary Rich 2 slot game are also available until the end of October. Information is available in Slots Lotty’s casino blog.